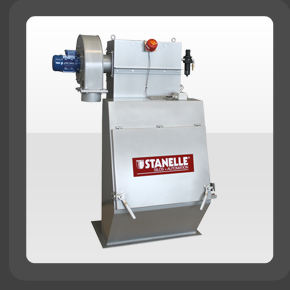 The Stanelle SSA-10 bag dump station has been specially designed so that it can be configured to empty bags without dust generating. The displaced air is fed directly into the BELFI filter and can then be channelled outside or into the production area depending on the application. Depending on the process specifications, it is possible to feed the product back into the process vessels or into a collecting tank.